“a greater advocate of the Grand Lodge could not be found than Christopher Thomson so long as a chance remained of him being nicely housed in a good berth; but when he found that neither the Secretaryship of the Widows and Orphans Society, General Funeral Fund or the Editorship of the Indicator was within his grasp, he turned round upon them and they were everything bad that his fertile mind could suggest……it is he that has kept the disaffected on their feet….”. “I would ask why did not the parties who were at the bottom of this movement show their faces at the annual meeting? 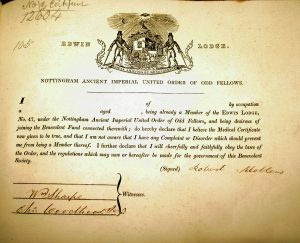 …one person in particular, Brother Christopher Thomson of Edwinstowe said at Leamington that there was no association in the kingdom in a better condition than the Nottingham Imperial Order. What can we think of a man who after expressing himself in a short time turns upon them and becomes their greatest enemy? Others may think as they please but I think there is no confidence to be placed in such a man; for it must be remembered a ‘double minded man is unstable in all his ways”. Shortly afterwards Christopher Thomson and his large family left Edwinstowe and settled in Sheffield working as a newsagent. This article is based with permission on the extensive research into the Oddfellows and other Benevolent Societies by the late Dr Julie O’Neill.